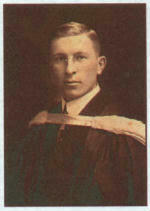 "Celebrating the life of a hero"
In 1941 Dr. Sir Frederick Banting, co-discoverer of Insulin, died in a plane crash near Musgrave Harbour, Newfoundland. The Hudson Bomber, with crew Captain Joseph Mackey, co-pilot William Snailham, and navigator William Bird, were enroute to England when they had engine trouble just after leaving Gander. They attempted to return to Gander, but didn't make it. Captain Joseph Mackey was the only survivor. The Musgrave Harbour municipal park was named in honour of Dr. Sir Frederick Banting and located in the park you will find the wreckage of the hudson bomber as well as a replica of the aircraft and an Interpretation Centre filled with artifacts related to Banting and the crash. The Banting Historical Trust Inc. was formed in 1997 to promote the development and heritage of the Banting Memorial Municipal Park and Interpretation Centre and related work interests.